Ugandan pop star-turned-lawmaker Bobi Wine, at the National Press Club, Sept. 6, 2018 in Washington. Robert Kyagulanyi, the Ugandan musician-turned-opposition lawmaker, has some advice for the youth in neighboring South Sudan. Kyagulanyi, known popularly by his stage name, Bobi Wine, is in the United States for medical treatment. He told VOA’s Straight Talk Africa that he was brutally tortured by Uganda’s Special Forces Command, a section of the Uganda People's Defense Forces. The Ugandan government denies the allegation. Mull Sebujja Katende, Uganda's ambassador to the United States who appeared on the same program, said the assertion was being investigated and that his country does not condone torture. Kyagulanyi took questions from VOA’s South Sudan in Focus on Wednesday following the live appearance on Straight Talk Africa. He sought to give encouragement to South Sudan’s youth, who according to Paris-based peace organization UNESCO make up an estimated 70 percent of the country’s population. South Sudan has been mired in conflict since December 2013, when fighting broke out in the capital, Juba. The country has almost 2.5 million refugees in the region, including over 1 million in neighboring Uganda, the largest host of South Sudanese refugees. 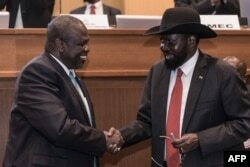 A peace deal was signed by the warring parties in Addis Ababa on Wednesday. In this photo taken May 2, 2018, men walk over to greet a humanitarian aid team in Kandak, South Sudan. Since the onset of violence five years ago, many South Sudanese have been accused of using social media to expand hate speech, division and tribalism. PeaceTech Lab, which uses technology to reduce conflict, published a lexicon of inflammatory words and terms in 2017 used by South Sudanese online. A survey it conducted found that 49 percent of all offensive and inflammatory terms that survey respondents provided appeared on the social media site Facebook. Kyagulanyi acknowledged that there are negative aspects of social media but said they can also be used to help improve lives. “In Uganda, social media has been responsible for creating jobs for technological advances for communication,” he said. Kyagulanyi said his generation is the first to have immediate access to social media, which have helped communities stay connected. “Indeed, it has never been there when we are so informed, where so many, not all of us, are very educated. But I know that we have the opportunity like social media and all the likes, we are so connected. So, there is no reason that we don’t constantly learn from each other,” said Kyagulanyi.